When looking for a total body strengthening and conditioning workout with the extra bonus of extreme fat burning, look no further than the kettlebell. The extreme value of one good piece of gym equipment is seen in the amazing kettlebell and the versatile training you can do with it. The kettlebell’s ability to strengthen major muscle groups as well as the body’s core makes it a primary focus of many who enjoy working out. Kettlebells are unique and require the use of proper techniques to get the best results and avoid injury. Once you learn the correct techniques for kettlebell exercises from a certified trainer, you are on your way to obtaining the body you’ve been aiming for. 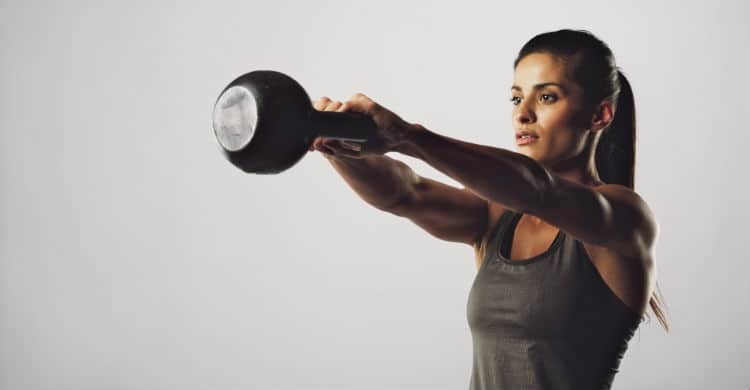 Strength and Core Training: Kettlebells offer the opportunity for explosive workouts which combine strength training, cardiovascular training, and core body work. Swinging these heavy objects raises your heart rate quickly, providing a comprehensive workout while improving muscle strength. Anyone can do a few kettlebell exercises, but when you tax your physical fitness level with the challenge of repeated kettlebell exercises, and add some variations to your kettlebell workout, your endurance will quickly improve along with the flexibility it takes to do the kettlebell exercises. So if you’re looking to beef up your workout routine by increasing your endurance and flexibility, kettlebells are a great solution. Kettlebells build powerful forearms and a strong grip. Their handle is thicker than a barbell’s handle—and this taxes your grip, building greater grip strength. They also help build greater forearm strength. They offer a fantastic workout without spending a lot of time at the gym. You can literally complete a great workout in a fraction of the time other workouts take, giving you more time to invest in the people and things you love. If you have a busy schedule, kettlebells alone can help keep you in shape. Kettlebell exercises are performed quickly, strengthening your power endurance—your ability to do fast muscular contractions over an extended period of time. Kettlebells are so portable, you can exercise with them anywhere. Imagine never missing a workout again because of easy access to kettlebells. Kettlebells improve your overall coordination. They are quite different from other types of exercise equipment and demand more coordination to perform the exercises properly. It’s wise to learn kettlebell exercises under the guidance of a certified trainer. Kettlebells’ combination of cardio and strength training helps increase your metabolism and therefore increases your body’s ability to burn fat all day long. So if you’re looking for a boost to your weight loss program, look to kettlebells. With your feet shoulder width apart, squat and pick up the kettlebell. Use your legs to lift the kettlebell while your shoulders remain down and back. Engage your glutes and hips and power through your heels as you swing the kettlebell forward. Engage your abdominal muscles throughout the exercise. The kettlebell should come to shoulder height. Then lower it back down. Swing in a smooth, fluid motion to gain the most benefit from the exercise. Turn the kettlebell upside down and hold it with both hands. Plant your feet shoulder width apart and turn your toes slightly out while lowering your body into a squat. Keep your abdominal muscles engaged throughout the exercise while pressing through your heels. Power up to standing position again. Hold the kettlebell with your right hand and hinge at your hips. Keep your back straight and parallel to the ground and pull your right elbow high. Next, lower the kettlebell down with control and good form. This exercise is physically difficult, yet it offers total body conditioning results. It builds explosive strength and strong shoulders. It requires good form and explosive hip power. Take the palm of your hand facing forward and grip the kettlebell lightly with your knuckles toward the sky. Pull the kettlebell down slightly, allowing the bell to flip over the top of your hand. Let the bell drop once you’ve initiated the movement. Avoid injury by starting with a lighter weight kettlebell and focusing on form. Good form is critical for proper kettlebell training. Allow your hand to grip firmly, but not too tightly. Keep wrists in a neutral position during kettlebell exercises. Relax your shoulders and utilize the strength of your core and hips rather than arms during kettlebell workouts. Engage your abdominal muscles during kettlebell workouts. Protect your back and keep yourself well balanced with the strong use of abdominals while doing kettlebell exercises. It’s vital to learn kettlebell workout techniques from a certified trainer in order to avoid injury. Develop good form with the coaching of a certified trainer to keep you in the safe zone so you can regularly enjoy the diverse benefits of kettlebell workouts. Once you learn good form from a certified trainer, you can do kettlebell workouts not only at the gym, but also in the privacy of your own home. So, if you choose to invest in one piece of gym equipment for the new year, consider the kettlebell for its portability, versatility, strength training, cardiovascular fitness, fat burning, and overall power endurance capabilities. Why not learn kettlebell training techniques in an atmosphere you can truly enjoy? Get personalized training for personal transformation at our gyms in the greater Tulsa/Broken Arrow area as well as the Jenks/South Tulsa area. Take a kettlebell class today at Elite Training of Tulsa.